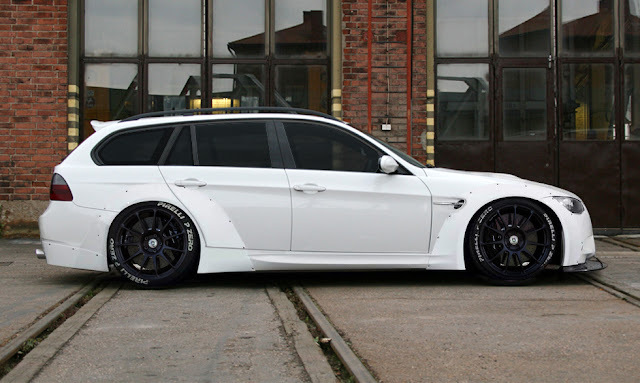 I created this "one off" widebody kit to suit my vision of the ultimate E91 Touring Wagon. Let's face it, just because the particular car you've chosen to work on is cool in your eyes doesn't mean that others have the same view. Sometimes aftermarket support isn't always the greatest but, that shouldn't deter you from choose that car you've had your eye on. In my particular case I've always had an eye for the BMW E9X chassis, especially the E91 Touring. After nearly a decade of ogling the 328i wagon I finally had the opportunity to purchase a perfect version to suit my vision. Well, to be honest a 335i E91 REALLY suited my vision but, that's a story for another day. In the pursuit of an aggressive "dailyable" grocery getter I decided the car needed to have widened arches. About the time of my decision to find an E91 for myself the Liberty Walk widebody invasion had just begun. 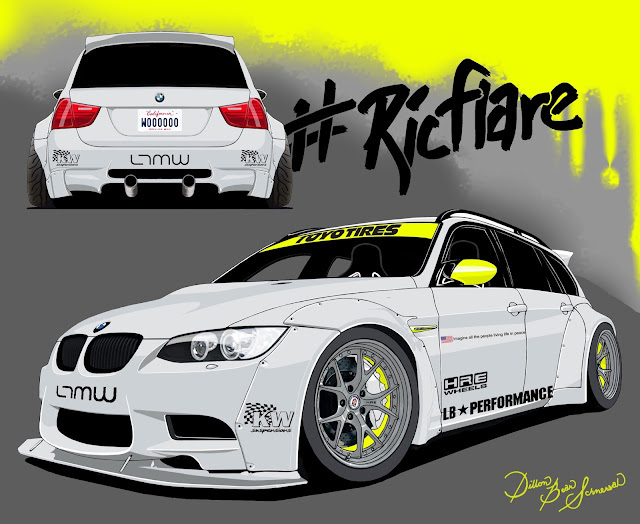 I suggested to my good friend, who also happens to be a designer, that I wanted to apply a Liberty Walk BMW E92 (coupe) widebody kit to the wagon. As with all proper builds it began with an initial rendering. My buddy whipped up the image you see below. Original concept turned into artwork to see what the overall vision might end up looking like. The moment I set eyes on that rendering above, I knew this unique project had to happen. The first hurdles were to 1.) obtain a brand new Liberty Walk E92 body kit and 2.) figure out what kind of budget it was going to take to get it done. I was so excited that I immediatly picked up my phone and started calling my industry friends to tell them about my idea. Thankfully my friend Long, of LTMW fame, happened to be the US importer for Liberty Walk aero kits. And just like it was meant be the boss of Liberty Walk was due to be in LA in the coming weeks for meetings. Long was able to get me on the schedule and set up a meeting with Kato himself. I was nervous to present my idea but it turned out he loved it, but he doesn't love 4 doors. Hence there are no kits for them. We agreed to a "partnership" on a kit and somehow it was agreed the car would debut at the Las Vegas SEMA show in just 3 short months. While I waited for the kit to arrive from Japan the chassis prep began, I started acquiring the parts needed and a "final look" rendering was created. This is the exact moment I told Liberty Walk Kato about my mental plan to cut up my BMW E91 and one of his amazing kits. He said "YES, DO IT!" and "I want to touch your beard". Dude is NUTS! Render of what was dubbed the #RicFlare project by Dillion Schmersal. More on that later. Now that the vision was clear and the parts secured, it was time to make it all come together. This is when I quickly came to the realization that modifying the kit to fit the car wasn't going to be as easy as originally thought. The front end (bumper, hood, fenders) and rear bumper were modified to use Original Equipment (OE) E90 M3 parts. 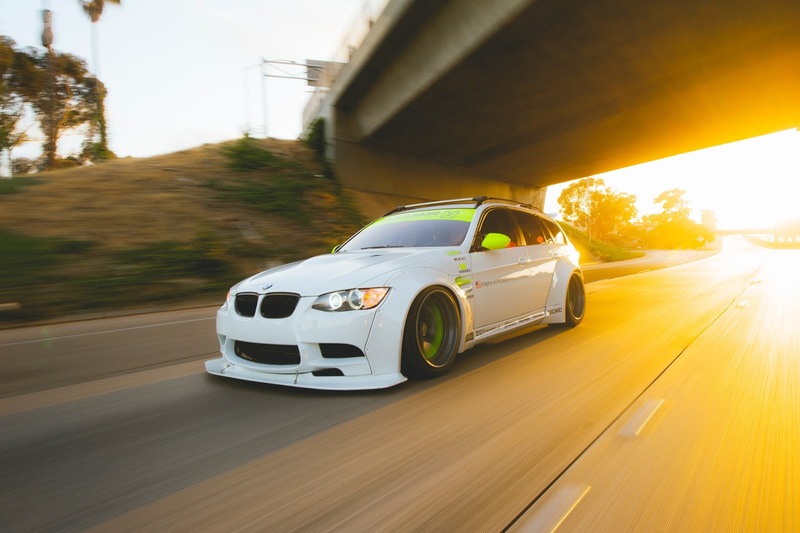 The only exception was that the OE front fenders were "modded" to use the E92 "gills" to provide a more aggressive look and ease the front over fender fitment. It did help but, there was much more that needed to be changed in order to get them to fit properly, and it wasn't easy. Follow along on the pictures below to see exactly what it took. 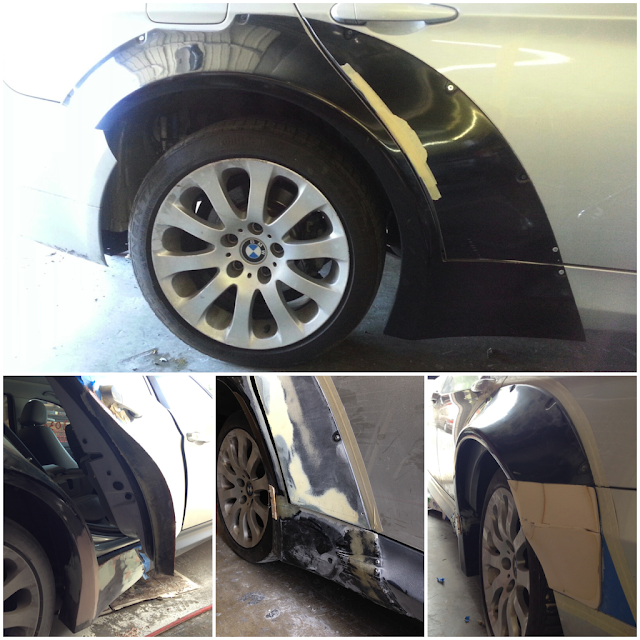 Here you can see the backside of the front fenders and how the E92 "gill" has been bonded to the E90 fender then painted. The front overfenders needed to be trimmed to match the factory angle of the body seam as the E90 and E92 differ in this area (who knew!?). The bumper extension and overfender were then fiberglassed into one piece and re-cut to match the OEM E90 bumper to fender seam. On to the rear end. As with the front, the rear needed considerable amounts of modification, creativity and fabrication. 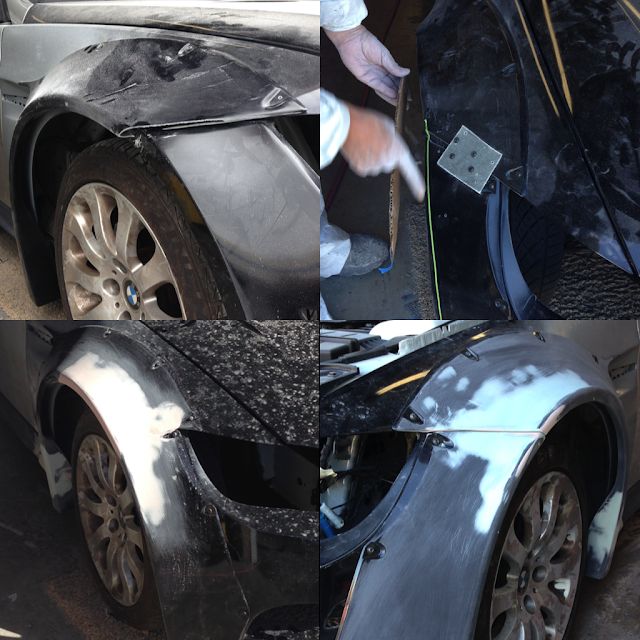 Obviously, the E92 only has two doors, meaning the overfenders would need to be fitted to the rear quarter panels and inspected to see what modification was necessary to make them look as though they were meant for the E91. Check out the photos below to see the process. The rear over fenders needed A LOT of work. They were first cut to accommodate the rear door seams as they were originally one piece. They then needed to be sectioned, smoothed, sealed in the jamb and reshaped to fit the E90 side skirt which isn't as aggressive (low) as the E92 counterpart. 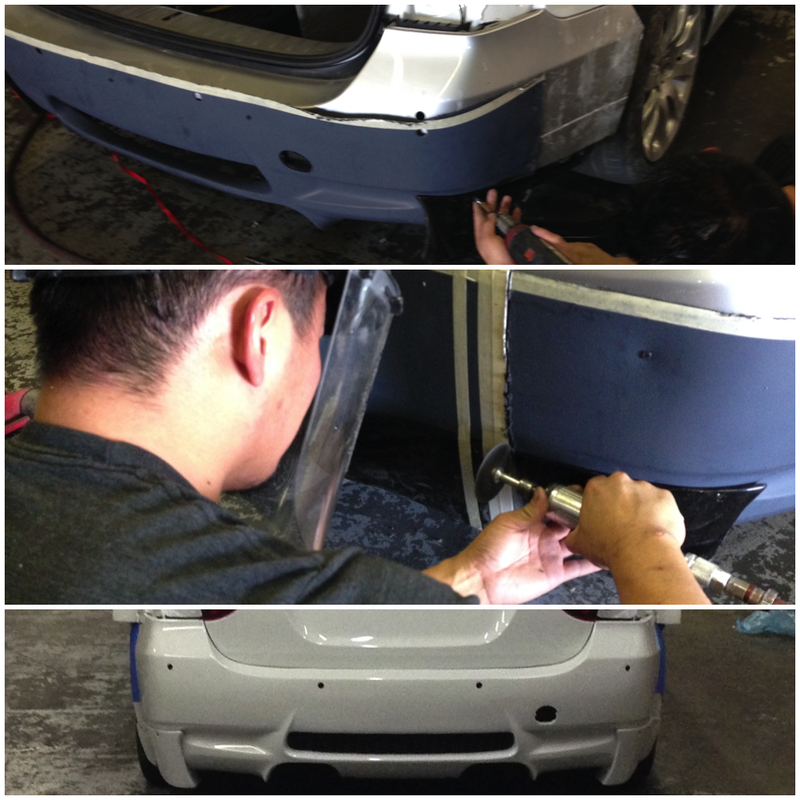 The rear bumper portion of the over fender needed to be completely created from scratch. As you can see foam was used to shape it then fiberglassed for mold making. 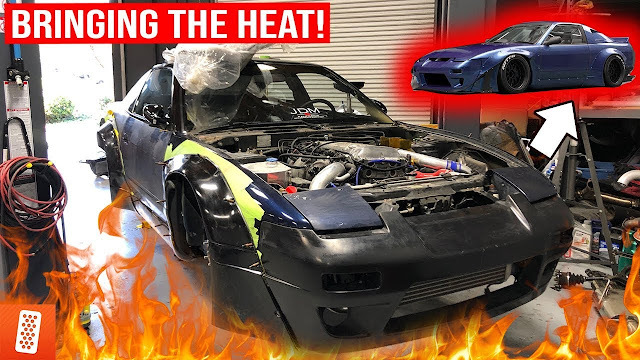 The rear of the car turned into quite the project and managed to eat up a large part of the short time frame to have the car ready for the SEMA Show. 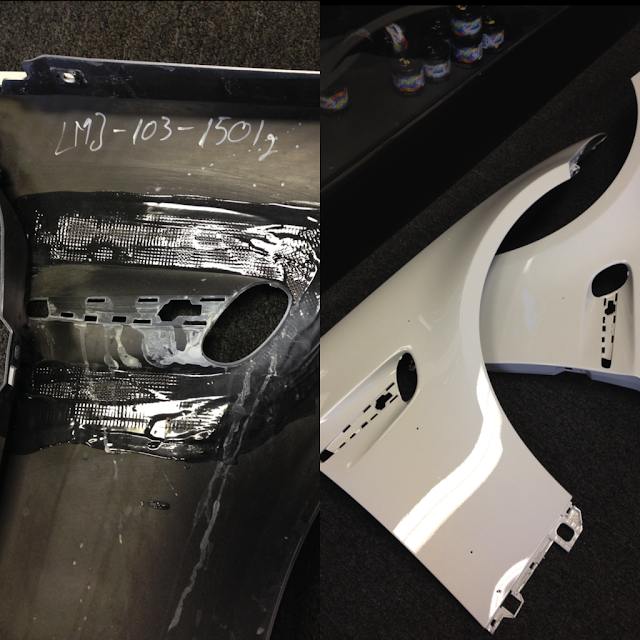 Once the fenders were completed they were delivered to LTMW where molds were made, real parts were "popped", prepped and painted all in-house. L to R. Parts prepped for mold making. Parts prepped for molds. Then painted after created from molds. Car almost ready to accept it's new widebody arches. The rear bumper was of course also a very time consuming custom project. 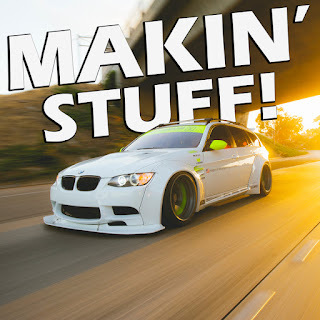 Because the rear overhang of an E90 Sedan and E92 coupe is much different than that of the E91 touring wagon a rear bumper needed to be custom fashioned by mating the two together. 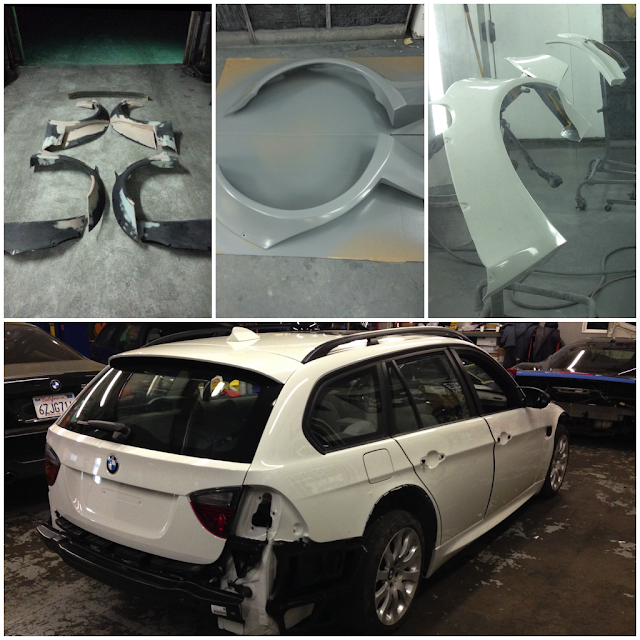 Essentially the top portion of the E91 bumper was retained and bottom portion of an E92 bumper was fused and smoothed giving it a factory M3 look using OEM BMW bumper skins. It was also lengthened on the sides by sectioning and adding material. As you can see, creating this unique beast was no easy task. But, with a lot of patience, hard work and help from friends it came to fruition. 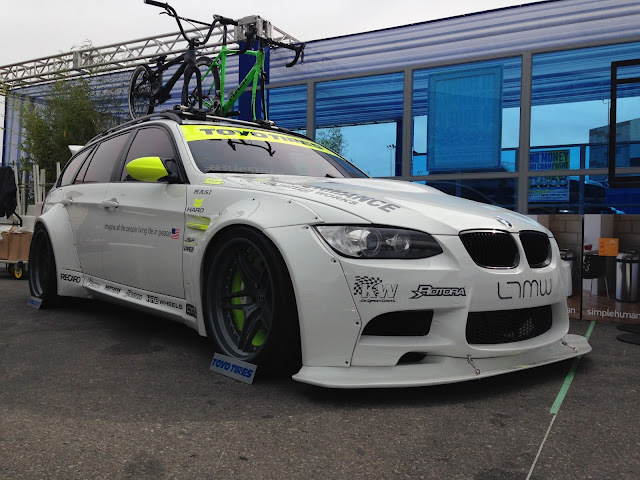 And, it even made it to SEMA on time! "#RicFlare" as it is dubbed sitting in the Toyo Tires Treadpass at SEMA 2013. This is my project and I put in long hard hours on it for three months straight leading up to the SEMA show. It took an army of people to get everything done in time and I made a ton of new friends in the process! One of the reasons I love the car community so much and will continue to give back wherever possible. 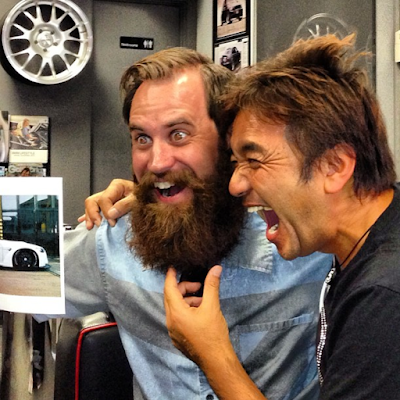 Apparently Japanese dudes love beards and took this photo with me during the thrash session leading up to the SEMA deadline. I hope you enjoyed Part 1 of this story and the way I see it there can probably 3-4 more installments if your interested. Please leave a comment below and let me know you made it to the end and want to see more!